ZeeGreen is founded by like-minded people who have a passion towards environment, crafts & horticulture. We are backed by a great team of professionals and we believe that customer's satisfaction simply equals success. All associates are dedicated to our mission towards a greener environment. Our focus is to provide you and the world with a sustainable environment. 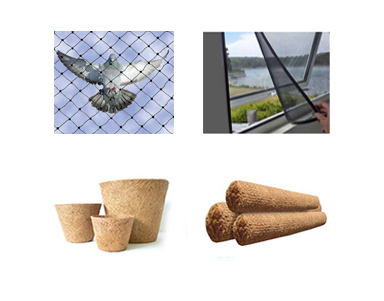 Anti Bird Net, Anti Pigeon Net, Anti Monkey Net, Anti Rat/Rodent Net, Anti Mosquito Net, Stainless Steel Spikes, Safety Net, Agro Shade Net, Sports Net, Rope Hammocks, Geotextiles. Nursery Pots, Root Trainer Pots, Seedling Trays, Fibre Trays, Hanging Baskets, Wall Basket, Window Planters, Orchid Pots, Vertical Garden, Coir logs, Coir briquettes, Coir Geotextiles. Made-to-Order Natural fibre Decor n Gifts of Vetiver River Grass, Banana Fibre, Coir, Jute, Sisal & Seagrass. The one-stop destination for Netting Solutions, Horticulture Accessories & Eco Crafts n Weaves. For free site visits, email or call us. © 2018 zeegreen.com. All Rights Reserved.